Personality disorders are lifelong mental disorders. Generally, personality disorder occurs in one’s teenage or early adulthood period. For example, Ms A needs and is dependent on others all the time, if she was to stay alone; she showed extreme fear of being alone. If she was asked to make decisions, she refused to make them or shows difficulty in making decisions. These behaviors of Ms A reflect a personality disorder termed as dependent personality disorder. There are different types of personality disorders and they are classified in the form of 3 clusters termed as A, B, C. So here we are going to understand some personality disorders which come under cluster A personality disorder. 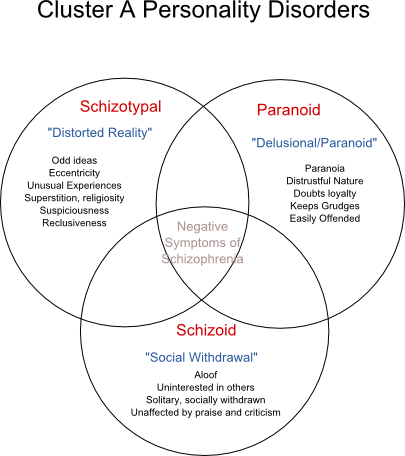 This cluster of personality disorders includes paranoid personality disorder, schizoid personality disorder and schizo typal personality disorder. Mr. A, who works as an accountant in a company, showed extreme suspiciousness towards others including his family members and office staffs. If someone looked at him, he showed angry reactions, due to the feeling that they were trying to harm his reputation. He has a love affair, but he distrusts the loyalty of his partner. And he never shared his matters with his partner or friends, on the basis of fear of using that information against him. Mr. A‘s friend is working in the same company, but at a higher post than he holds. Mr. A showed extreme level of jealousy by making his friend’s car dirty or hiding his important files. Moreover, Mr. A also holds grudges and never forgives others. From this behavior of Mr. A we can reach in a conclusion that he has some abnormalities in his personality. Mr. A has paranoid personality disorder and this disorder is commonly seen in males. Individuals with this personality disorder face difficulty in maintaining interpersonal relationship, and they give more importance to their self. In childhood and adolescence,it can be found in the form of keeping distance from others, poor peer relationships, hyper vigilance and strange fantasies. Here is the story of Mr. B. He stayed away from others and chose solitary activities. He had close relationships only with his parents. He worked better, if he was alone. When his parents forced him to contact others, he became anxious. For this behavior he was criticized by others, and sometimes the same people praised him for his great work. But Mr. B reacted indifferently to this criticism and praise. One day his colleagues teased him for his strange behavior. At that time Mr. B showed neutral emotional response as if he was a robot. His colleagues knew that he never got angry or sad, so they continued teasing. Even then, he showed poor emotional response. From Mr. B’s story, we can understand that there is some deviations in his personality. 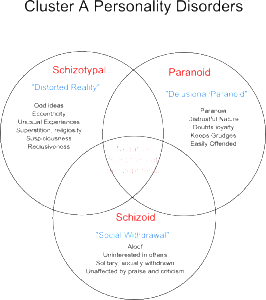 This deviation in his personality is known as schizoid personality disorder. Individuals with this disorder prefer to stay alone and engaged in day dreaming. They restrict their emotions, so that they are unable to show anger or other emotional responses. They experience difficulty in working in groups. Here is the story of Mr. C, who showed similar behavior. Mr. C also showed reduced capacity for maintaining relationships and experienced discomfort in social settings. Since childhood, Mr.C showed extreme interest in paranormal experiences. And this interest began to dominate his life at the cost of exclusion of other activities. Then he started to spend a lot of time on visiting websites that advertised paranormal research, and he persistently asked his parents to purchase ghost hunting equipment. And he also reported that he could see ghosts and he often attempted to take photographs of ghosts near old villas. With this extreme curiosity, Mr. C also heard some voices calling his name every night. One day he attended a spiritual lecture given by famous Guruji. After that, he started to claim that, he has got a hidden message in that spiritual lecture which is specifically conveyed by Guruji to him. So these behaviors of Mr. C reflects schizotypal personality disorder, which have inappropriate beliefs that they can influence others by their thoughts. The exact cause of cluster A personality disorder is unknown, but it appears to be more common in families with mental illness, which suggests a genetic influence. Other causal factors can be environmental and family background. If a child is reared in a conflict family background, then there are some possibilities of developing personality disorders. From conflict family background, children may lose trust in others. Slowly they would develop suspiciousness towards others. Researchers suggest that, verbal abuse can have an impact. In a study of 793 mothers and children, researchers asked mothers if they had screamed at their children, told them they didn’t love them or threatened to send them away. Children who had experienced such verbal abuse were three times more likely as other children to have paranoid personality disorders in adulthood. Psychotherapy, medications, and self help groups can be used for treatment of cluster A personality disorder. But individuals suffering from this personality disorders never trust others and also shows discomfort during interaction with others. Generally, family members force them to undergo therapies and to take medicines. So conducting psychotherapy for this group of personality disorder would be a challenging task for the therapist. Even then, psychotherapist can use behavior therapy which focuses on behavioral abnormalities and enables patients to change behavior or to achieve better control of their behaviors. Therapist can also use cognitive therapy which helps patients to correct their distorted pattern of understanding of the significance of incidents that happening in the patient’s environment and underlying core beliefs that lead to maladaptive behaviors. Another approach that can be used by therapist is humanistic approach, in which therapist helps to increase self directedness and cooperativeness and this skills would help patients in achieving personal and social maturity in a form of altruistic individualism. Medications would help to decrease their anxiety level. Applying self help group (individuals with same problems are grouped to help each other to overcome problems they face) would be effective when they develop insight about their personality disorder.